The Dead Sea is one of the world’s most curious phenomenon. Located 420 meters below sea level, it’s the lowest dry land on Earth. The salinity level, at 30% is 8.6 times saltier than the ocean. This salty lake is bordered between Israel and Jordan. Naturally, it’s on my list of place to visit while I’m in Israel or Jordan as I’m visiting both countries. Since my friend in Jerusalem offered to take me, I went to Dead Sea in Israel. Masada and Ein Gedi are the two most suggested places to go to the Dead Sea in Israel when I was planning, but they’re both really far from Jerusalem. We decided to just do Dead Sea day trip from Jerusalem. Kalia Beach is about hour and a half drive from Jerusalem and it was just fine. How low will you go to get a drink? 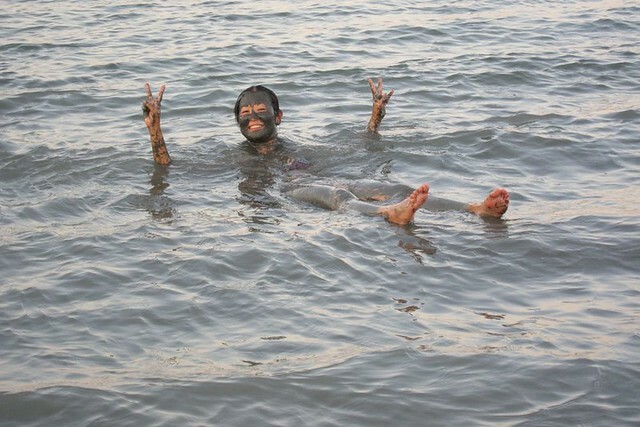 Due to the high salinity of the Dead Sea, it makes anyone float effortlessly. I tried to sink (of course) but it just flips you over! So how salty is it? Like I told my sisters, it’s saltier than if you put a spoonful of salt in your mouth. I tasted it (of course!). I dabbed a drop on my tongue and it stung. You won’t even associate the sensation with saltiness, more like something cutting your tongue! Ladies be forewarned (I was), so you’re going the beach and parade in your bikini, so you may naturally decide to shave your legs and various areas, think again. I had a small cut in my fingers and it stung! I can only imagine what it will feel like with million of mini cuts. And I guess, needless to say, do not dip your face into the water. But for some reason, my friend did, and was crying for a long time. I didn’t know that there’s a standard touristic photo of reading a book while floating the dead sea, sayang. So I only had this photo. WWOOF is just a portal for volunteers and farms. You have to read the reviews on the particular farm you’re going to. Hey ms. wanderlass! i wanna experience floating in the Dead see too! (since i dont know how to swim, this will be the only see in the world that i get to foat ayt?). anyway you can direct me on how to get a jordan tourist visa from Pinas? I am heading to Jordan from on November and I know the weather will be colder. this is on my bucketlist! Looks awesome! Such an awesome experience that I want to have myself!!! Love the pics! You definitely should! It’s really a great experience. You’re really living your dream, Lil. Way to go! Enjoy and stay safe. Keep off the mines. The high salinity is due to the rapid evaporation rate. The Red Sea is I think the second most salty… This has to be taken into consideration when bringing ships from the Indian Ocean, or through Suez. Top heavy boats are not stable and if sufficient ballast cannot be added they could capsize.